Around a year ago, a puzzle competition named “JdZdC” was held in Japan. 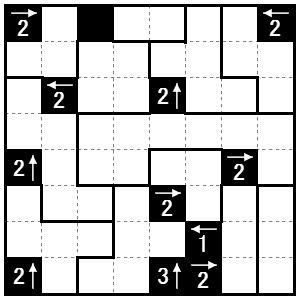 The puzzles are published recently; see here. I made Round 4 for this. I used new puzzle types themed by “warp” (I wonder if this usage of the word is Japanese style; we mainly use this SF meaning), and here I will write about this theme. Rules: Place two circles (warp hole) into every region. From each arrow, a spirit starts in that direction. When it reaches to a circle, it goes to the other circle of the same region, and restarts to the same direction. The numbers beside arrows show how many times warp holes are used by that spirit. Every warp hole must be used at least once. I liked this type, especially the concept of warp, but it soon disappeared. I believed this concept can be used more in puzzle, and my round in JdZdC was my answer to this. English instruction is prepared here. Note that this round was so hard because of my misjudgment. I asked gorogoro for test solving, and thankfully he also made some good puzzles. So they are included in bonus puzzles. Credits are not written explicitly, but obvious from the figures. Japanese are used in some gorogoro's puzzles. It is hard to explain all, but I especially want to explain one of them. See page 2 of the bonus puzzles. Target word in the 2nd puzzle is based on a tongue twister, which is related to peach. And mirrors in the grid also represents peach. This is deformed representation, but common in Japan. This offline competition will be held again in March. I hope we can publish the puzzles earlier this year.